Did you know that photos on this blog do not look their best when displayed using IE7, the Explorer browser? They do look crisp in Firefox and Safari though. I tried to get some answers and a way to fix them in IE, but that did not happen. All the tech guys offered for advise was that my blog loads too slow and that I should not link to the photos. I like linking. Does my blog really load too slow? I don’t want to pay for space on wordpress to hold photos already on flickr. Decisions, decisions. 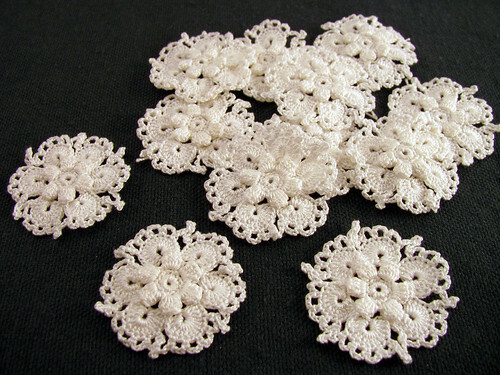 Onto better things, I have the motifs for round two of the big rose doily done. I still need to attach them. This entry was posted on Monday, January 26th, 2009 at 3:00 am and is filed under Crochet and Lace. Tagged: Crochet, Doily, Lace, Thread. You can feed this entry. You can leave a response, or trackback from your own site. your blog comes up as quick as any – but i use a mac and firefox. I have safari which i hardly ever use. I got really frustrated with ie over a year ago and took it off my computer. every once in a blue moon a site only works with ie and i either decide I don’t want to look at it after all or I borrow my husbands laptop – but I think I only did that once. What brand of thread is that? It photographs very well. It is Cebelia crochet cotton, size 30.